Speaking of Nordic design traditions, here are four of my 50’s favourites from Sweden! Over the recent years the interest for vintage design, especially from the 40’s and the 50’s, has exploded in my little country! As a former potter I’m ridiculously smitten with kitchen ware, especially cups, and I cannot help being as nostalgic as everyone else about this particular period! 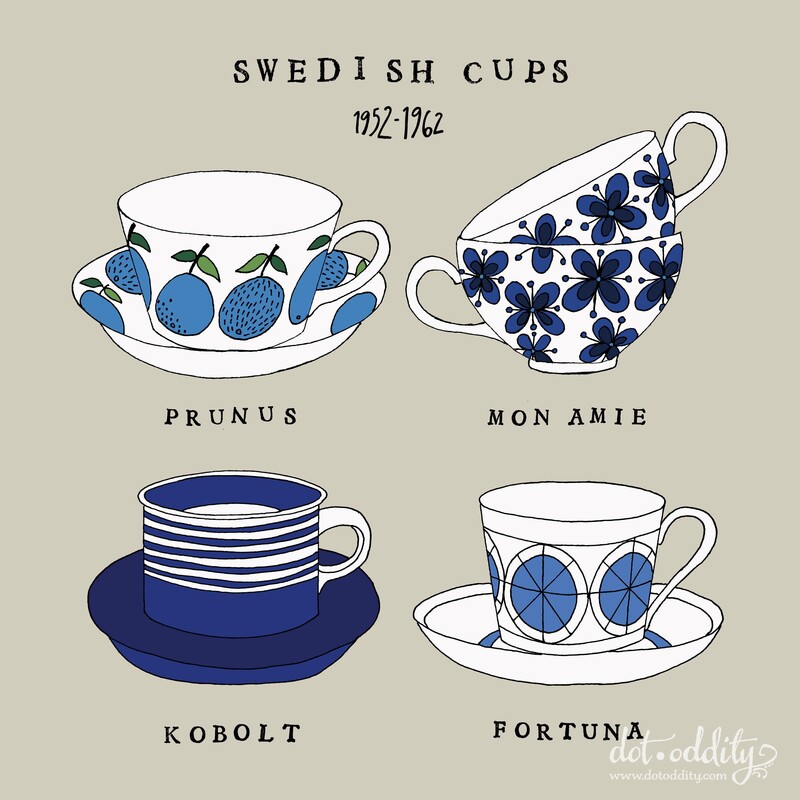 This is a print I’ve made of Swedish cups from this golden era. Top left is “Prunus” by a giant of Swedish design, Stig Lindberg, art director of the legendary Gustavsberg Pottery factory 1949-80. Many of you might recognize his iconic leaf pattern “Berså” (1960) from which Orla Kiely drew her inspiration. “Mon Amie” was created by Marianne Westman in 1952 and was produced until 1987 by Rörstrand. Bottom left is “Kobolt” (1958) by another of the big design pioneers, Karin Björquist, who later on got the honour of designing the Nobel Banquet Tableware for the 90th anniversary of the Nobel Prize in 1991. And lastly the cup “Fortuna” by the internationally less known Swedish designer Arthur Percy for Gefle Porslinsfabrik in 1960. Unfortunately I can’t find a good link in English about him! Don’t worry, the Swedish designers will be seen again (and again!) over here as this is one of my favourite topics!